In this year of the World Cup, 14 different nationalities and citizenships are represented, including the World Cup qualifiers Iran, Switzerland, Poland, Mexico, Argentina, Colombia, Nigeria and Morocco, along with non-qualifiers China, India, Canada, Netherlands, Mauritius and – yes – the U.S. In all, 28 percent of the class holds citizenship in a country outside of the U.S., including dual citizens. In addition, the 88 students come from 78 different organizations. 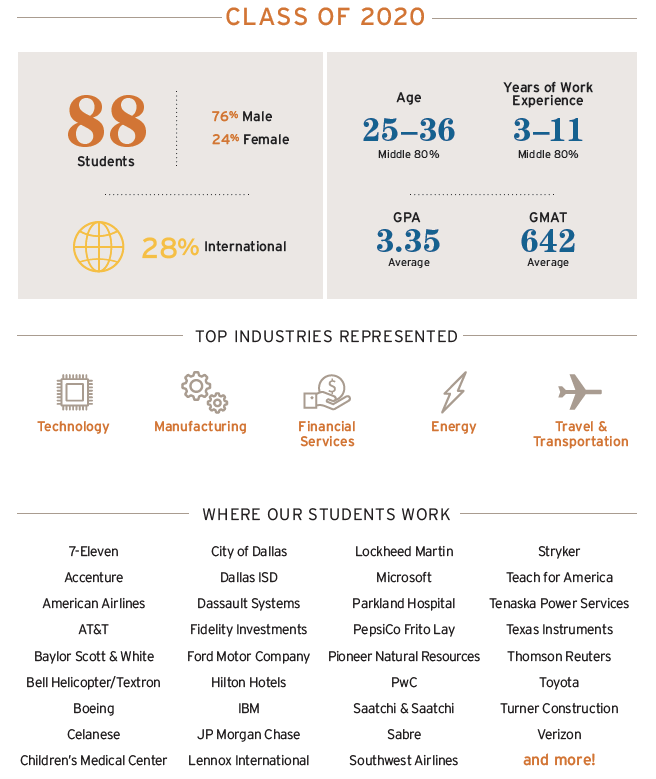 No company has more than two students in the class with 10 companies represented by two: American Airlines, AT&T, Citigroup, Tenaska, Sabre, Lockheed Martin, Texas Instruments, Thomson Reuters, Turner Construction and Dassault Systems. The class has 24% women, continuing the trend of overall growth in the number of women in the DFW program. The last three incoming classes have had the three highest numbers of women in our program’s history. In addition, 15 members of the class are from under-represented minority groups and 15 are first-generation college graduates. Seven members of C/O 2020 already spent their undergraduate years at UT Austin. The UT system as a whole is well-represented, by UT Dallas, UT Arlington, UT San Antonio, UT El Paso, and UT MD Anderson. Other schools with multiple incoming students: SMU, TCU, Baylor, Purdue, Arkansas, Michigan, Oklahoma, Florida, Wisconsin and the US Military Academy. And five of the class served our country– four in the Army and one in the Marine Corps. 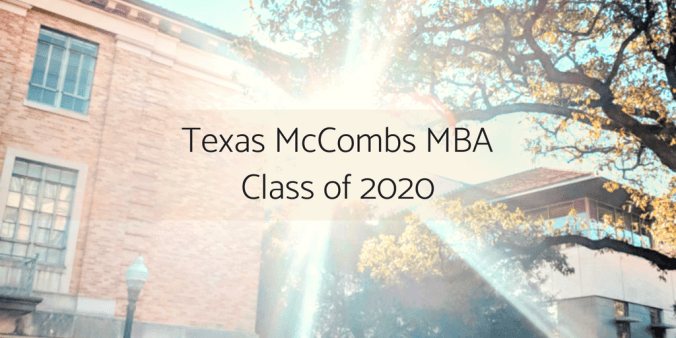 We feel humbled and privileged by the amazing experiences and perspectives making up the Texas McCombs MBA Class of 2020 and cannot wait to see what they accomplish during their time in the program. 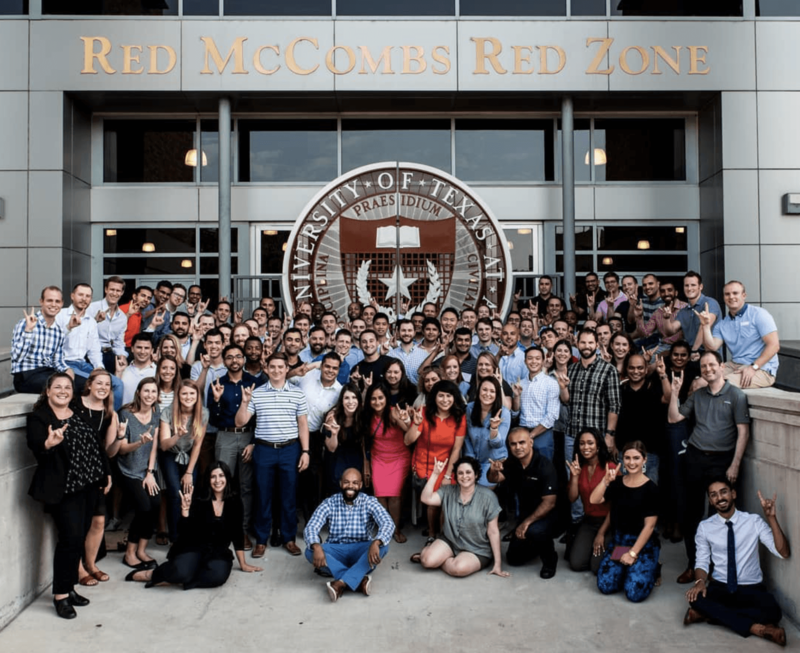 If you’d like to join them as part of Texas McCombs MBA network, our 2018-2019 application is open! This post is part of our MBA Class of 2020 series. Next, we’ll dive into what makes our MBA at Houston stand out. We look forward to meeting you and reading your application. Hook ’em!